Boortsog, boorsoq, bauyrsaq, or baursak (Bashkir: бауырһаҡ, Kazakh: бауырсақ [bɑwərsɑ́q], Kyrgyz: боорсок [boːrsóq], Mongolian: боорцог [ˈpɔːrtsʰəq], Russian: баурсак, Tatar: Cyrillic бавырсак, Latin bawırsaq, Uzbek: bog'irsoq [bɒʁɨrsɒ́q], Tajik: бусроқ [busrɒ́q], Turkish: pişi, bişi, tuzlu lokma, halka, Turkmen: pişme) is a type of fried dough food found in the cuisines of Central Asia, Idel-Ural, Mongolia and the Middle East. It is shaped into either triangles or sometimes spheres. The dough consists of flour, yeast, milk, eggs, margarine, salt, sugar, and fat. Tajik boortsog are often decorated with a criss-cross pattern by pressing the bottom of a small strainer on the dough before it is fried. Boortsog is often eaten as a dessert, with sugar, butter, or honey. They may be thought of as cookies or biscuits, and since they are fried, they are sometimes compared to doughnuts. Mongolians and other Turkic peoples sometimes dip boortsog in tea. In Central Asia, baursaki are often eaten alongside chorba. Dough for Boortsog ranges in ingredients from a simple dough, to a sweeter, crispier dough. For example, a typical Kyrgyz recipe calls for one part butter, 7 parts salt water, and 6 parts milk, along with yeast and flour, while more complex recipes add eggs and sugar. Boortsog are made by cutting the flattened dough into pieces. While not usually done in Central Asia, these pieces may be bent and knotted into various shapes before being deep fried. This is especially common among Mongolians. The dough is deep-fried golden brown. 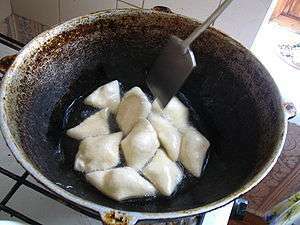 Mutton fat is traditionally used by Mongolians to give the boortsog extra flavor, but vegetable oil may be substituted. The biggest (179 kg) baursak was cooked April 20, 2014 in Ufa, Russia. 1,006 eggs, 25 kg of sugar, 70 kg of flour, 50 kg of Bashkir honey were used for its preparation. A Guinness record was made in Almaty, September 7, 2014 during the celebration of Mother's Day, when 856 kilograms of baursaks were cooked in one place in one day. The celebration was held in the form of a culinary battle between teams of mothers-in-law and daughters-in-law. Seven teams participated in the competition. Mayhew, Bradley; John Noble (2007). Central Asia: Kazakhstan, Tajikistan, Uzbekistan, Kyrgyzstan, Turkmenistan. Multi Country Guide. Lonely Planet. ISBN 1-74104-614-9. Retrieved 12 November 2009. Schreiber, Dagmar (2008). Kasachstan: Auf Nomadenwegen zwischen Kaspischen Meer und Altaj (in German) (3rd ed.). Trescher Verlag. ISBN 3-89794-137-6. Retrieved 12 November 2009. Waters, Bella (2007). Kazakhstan in Pictures. Visual Geography (2nd ed.). Twenty-First Century Books. ISBN 0-8225-6588-9. Retrieved 12 November 2009. ↑ Mayhew and Noble (2007), 112. ↑ "В Уфе на изготовление самого большого баурсака России потратили 1006 яиц // ОБЩЕСТВО | новости башинформ.рф". www.bashinform.ru. Retrieved 2016-09-08. ↑ "Новый рекорд Гиннесса установили в Алматы в День Матери - Фрагменты жизни в Казахстане и мире – интересные истории | Tengrinews". Tengrinews.kz. Retrieved 2016-09-08. Wikimedia Commons has media related to Bagirsaq.